Four Standard Buildings and 4 special buildings are available in the base game. These buildings each provide unique special abilities during play and/or VP at game end. 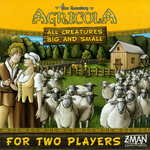 Balancing the tension between building infrastructure (fenced pastures and buildings) and acquiring animals (the single biggest source of end-game scoring) is the key to success!